Gloria Gilcher was on the United Way of Williams County Board from 2008-14. She and Jim were asked to chair in 2014, but her mom had died and they had details to wrap up on her mom’s farm. Fast forward to this year’s Bean Days Festival parade where the Gilchers were helping with their church’s float and they noticed Bill Pepple (director of Williams County’s United Way) in the next row. The Gilchers are a natural fit for the job, Pepple said. 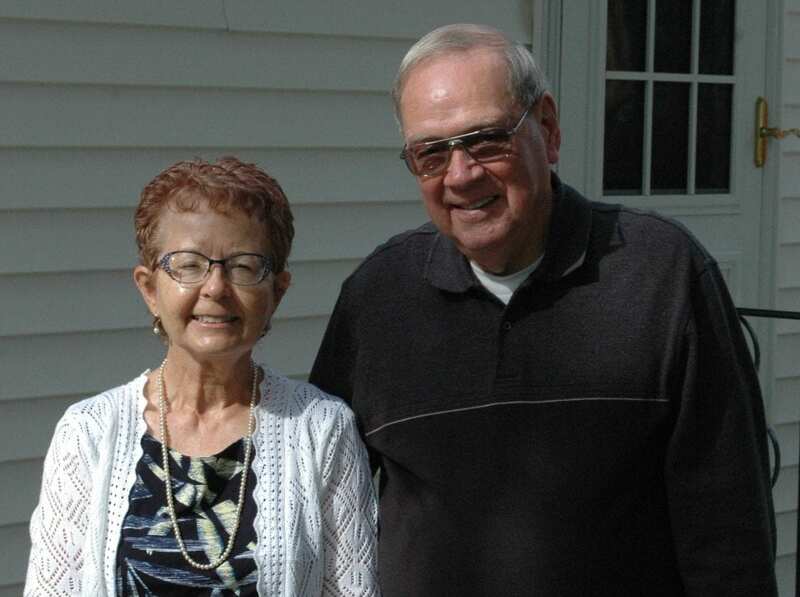 “Jim and Gloria have a passion for the work of United Way in Williams County,” Pepple said. “They care and want to help others who are less fortunate. As chairs, the Gilchers give a lot of interviews and wrote a letter and sent it to a list of people who have given to the United Way the last 5-6 years, Gloria said. The participated in the Williams County Fair Kickoff, she said. Gloria gave a little speech and Pepple said a few words in front of the grandstand. The event featured people holding signs describing the various agencies United Way supports. The couple will appear when asked like they did at a cookie and wine soiree at Cookies on Demand in Montpelier recently. They are the lead cheerleaders for the fundraising efforts, Jim said. The campaign’s goal is $380,000 by Dec. 31. Near the end of October, the collection had brought in almost $50,000. “We have a lot of personal donations and a lot of companies,” Gloria said. Pepple and his assistant are going out to speak to local businesses to drum up support, she said. The agency has a list of companies who give every year, Gloria said. “They actually do all the work,” Jim said of the companies. Serving as campaign chairs does not place a huge demand on the Gilchers’ time. This is the first time the pair have been involved as campaign chairs. Gloria had only been involved with the United Way since 2008. The former director came to a Lions Club meeting and talked about the agency and that’s how Gloria got on the United Way board, she said. Gloria served on the marketing committee in an effort to keep the agency in the minds of people around the county. “We had meetings once a month,” Gloria said about why she stayed on the board for six years. “And did whatever we could to promote the United Way. That included going to different towns in the early morning in October and greet people on their way to work. “We would stand on a corner and hand out hot donuts to people in cars,” Jim said. The group borrowed figures from the 4-H and put United Way T-shirts on them and place them in different towns, Gloria said. They served a pancake breakfast for a couple of years, she said. “We did a pizza day in the summer and had the shops donated a part of the proceeds,” Gloria said. One program that keeps Gloria and Jim coming back is the Dolly Parton Imagination Library. The agency has 1,000 kids in the county signed up to receive a book every month until they are age 5. The United Way pays $30 a year for the service and volunteers promote it to parents to get their kids signed up, Gloria said. It’s rewarding to see kids who are getting that book a month, she said. At a booth they manned at the fair this year, they had many parents who walked by saying their kids were already signed up, Jim said. Gloria also likes the Bed Brigade that made more than 1,000 beds for people in Williams County. “I just think that is so awesome,” Gloria said. The couple has found the experience to be rewarding. They enjoy working with Pepple. “From here on out as the figure increases, gets higher and higher, it will get more exciting,” Jim said. “It’s just something we can do to give back,” Gloria said. “Our Lions motto is ‘We serve’ so we try. People should know the money given to the United Way stays local. That is a blessing for a small county such as Williams, Jim said. “Jim and I hope to do the best job we can do and meet that goal,” Gloria said. Before retirement, Jim worked for the Ohio Art Company for 37 years as a buyer, while Gloria worked at Robinair in Montpelier for 35 1/2 years. She got downsized and worked at the library in Bryan for a couple of years before working at Air Mate for nine years. After being downsized once again, she went to work for the Montpelier Library for 5 1/2 years before stepping aside. The couple would like to see more small towns represented in future campaign drives. “We can always use volunteers,” Gloria said. Be the first to comment on "Kunkle Couple Leads Williams County Campaign Drive For 2016"